Last week Blackhouse HQ temporally relocated to the birthplace of Harris Tweed: The Islands of Harris and Lewis. We stayed in the beautiful Gearrannan Blackhouse village, which was so aptly named for our visit. We couldn’t have possibly stayed anywhere else! It was here the Blackhouse team brainstormed until the wee hours of the morning, coming up with new ideas for product and design. Whilst on the Island we visited the mills where the tweed is produced. They are a friendly bunch, and didn’t mind taking time out of their busy schedule to show us around and give us an in-depth lesson on the laborious Harris Tweed process. Before we knew it, it was sadly time to come home. We made the scenic journey back to Auchtermuchty across the choppy sea at dawn. The trip was a definite success, and we urge anyone thinking of visiting the Outer Hebrides to go ahead and book it a visit to the the heart of Harris Tweed production! From the iconic to the occasional, our furniture celebrates the heritage of Harris Tweed, Woven on treadle powered looms, Harris Tweed is crafted by hand without the aid of automation or electricity. Weaver’s skills take months to learn and years to master and every step of the Harris Tweed process is in the hands of skilled islanders, from dyeing to delivery. 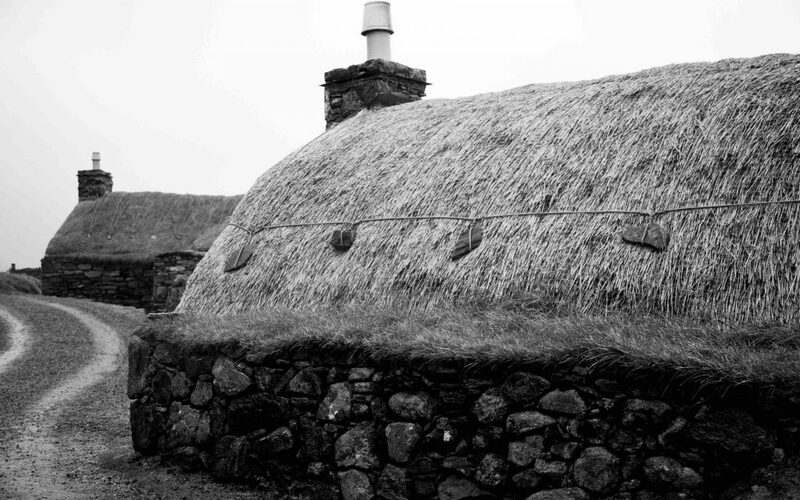 Blackhouse has absolutely fallen in love with the Island, it’s Harris Tweed and it’s people.